A simple and elegant design; layers of rich, moist chocolate cake alternate with light zesty lemon cake. The tiers are decorated with soft chocolate fondant icing flavoured with milk and white chocolate for contrasting effects. 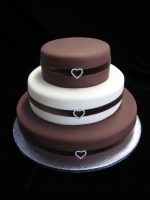 Each tier is finished with a chocolate brown velvet ribbon and a diamante heart.